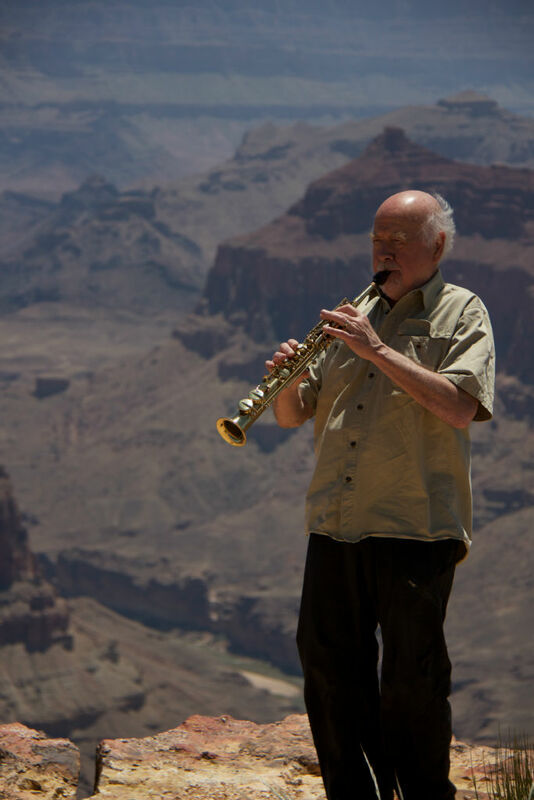 Paul Winter is a 7-time Grammy® Winner. He won a Grammy in 1993 for Spanish Angel, in 1994 for Prayer for the Wild Things, in 1999 for Celtic Solstice, in 2005 for Silver Solstice, in 2007 for Crestone, and in 2010 for Miho: Journey to The Mountain. Paul also received Grammy nominations for 8 other projects. In addition, he co-produced and recorded an album by Pete Seeger entitled aptly, Pete, that won the Grammy for Best Folk Album in 1996. Let us explain how Paul Winter, a renowned jazz instrumentalist, became friends with Pete Seeger, a folk poet who wrote songs like "Turn Turn Turn" and "If I Had a Hammer?" And how did Paul first come to meet Pete? To get that answer one must travel with Paul Winter, from Pennsylvania through Chicago by way of Latin America, on to California and finally end up in 1966 at The Newport Folk Festival. Paul Winter grew up in Altoona PA during the 40's and 50's listening to the sounds of Benny Goodman, and the Glenn Miller Orchestra. He was fascinated with instruments from as far back as he could remember. Altoona, had the whole gamut of bands and orchestras, from all the European heritage of the 19th, and up through the big band music of the 20th century. The Winter Music Store, which Paul Winter's grandfather had founded in the 1880s, continued under the tutelage of his uncle and his father into the 1940s, carrying all kinds of instruments, and was the Steinway dealer for Central Pennsylvania. Winter played clarinet in high school. As a self-professed "instrumentalist" he wasn't much interested in singers at the time, and switched from clarinet to saxophone, when he joined various dance bands. In 1961 while he was at Northwestern University in Evanston, Illinois, the band that he founded, The Paul Winter Sextet, won the Intercollegiate Jazz Festival. Two of the judges of that competition were Dizzy Gillespie, the iconic trumpeter who along with Charlie Parker, ushered in the era of Be-Bop in the American Jazz tradition; and John Hammond, the famed record producer and civil rights activist, who also worked for Columbia Records. The prize for winning the Intercollegiate Jazz Festival was a record contract with Columbia Records. In 1962 he and his Sextet were sent by the State Department on a 6-month tour of 23 countries to Latin America, where they performed 160 concerts in 61 cities. After the tour they were invited to play at the White House by First Lady Jackie Kennedy, becoming the first jazz band ever to play at the White House. In his travels through Latin America Paul became heavily influenced by the traditional folk music he heard there. Upon his return to the US he recorded his first 3 albums with Columbia Records, with some of the pieces being inspired by the music he and his band had heard on tour. Folk music was rapidly becoming popular worldwide, and an idea had arisen to perhaps do jazz interpretations of traditional folk songs. Paul began kicking around ideas with John Hammond about recording an album that would eventually become known as Jazz Meets the Folk Song. Hammond suggested that he was going to record Pete Seeger's concert at Carnegie Hall the following night and invited Paul to accompany him. "My experience of Pete's concert was a revelation," Winter explains "here was an authentic voice like a unique horn, that was both raw and gentle, powerful when it wanted to be, and enormously versatile with a range of different genres, brogues and languages. The songs were about real issues of the time, and the audience sang along rapturously. I had never been to any event like this." The concert became Pete's album We Shall Overcome. "Hearing it again after half a century," muses Winter, "I wonder if it is not Pete's greatest?" In October 1963 The Paul Winter Sextet began recording Jazz Meets the Folk Song and were finishing the album at the time of President Kennedy's assassination on November 22nd. In early December they booked their final session and recorded the album's closing song, "We Shall Overcome." In the summer of 1965 a friend of Paul Winter's, Peter Yarrow of Peter, Paul and Mary, told him about a Broadway show called Wait a Minim (minim being a musical term for a "half-note"). The show was a musical revue from South Africa about apartheid with the seven person cast playing at least 50 African instruments, many of which Winter had never heard of. Paul loved it so much and ended up seeing the show 12 times, finally summoning up the courage to go to the stage door to meet some of the cast. He met Andrew Tracey, the wonderfully friendly leader of the cast who knew Paul Winter by reputation. Andrew took Paul to the theater basement and introduced him to his brother (also named Paul) and to an instrument called an Amadinda, a three-person Ugandan xylophone. The three men sat down cross-legged on either side of the Amadinda, and Paul and Andrew Tracey taught Paul Winter a melodic line to play in polyphony with the other two lines. So he was to play in a hocketing pattern, which means playing in between the beats of the opposite player. "I didn't think I did it that well," reflects Winter, "but at least I could remember my melodic line." Andrew Tracey asked him later, "We're playing the Amadinda at the Newport Folk Festival in July. Would you like to play it with us? 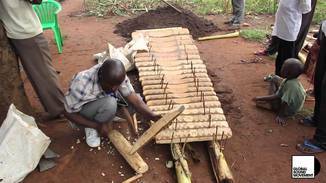 I'm sure you'll do it well by then," he continued, laughing. Paul nervously agreed, and on the appointed day of the "ethnic instruments program" at The Newport Folk Festival he was rehearsing on stage with Paul and Andrew, when all of a sudden he became aware of a body lying beside him. The tall rather lanky chap was underneath the Amadinda peering up at its underside, trying to figure (it would seem) out how the instrument was constructed. After a moment or two the bloke realized that Paul Winter was staring at him, and with a big smile, he returned Paul's gaze and said "Hi, I'm Pete Seeger." From that moment on Paul and Pete became firm friends, discovering a mutual passion for collecting unusual instruments such as the Amadinda. In a recent telephone interview with Paul we asked him to name a few of his favorite instruments. Without hesitation he told us, "From my travels, I have somewhat of a collection of percussion instruments from different cultures, including sets of Brazilian samba drums, a 700-pound log 'talking drum' from the Congo, eight large Balinese Gamelan gongs, clay darbuke drums and Bedouin camel bells from the Middle East, and lots of shakers and small percussion instruments And, we made an Amadinda (log xylophone) bridge, over a small brook here at my farm." 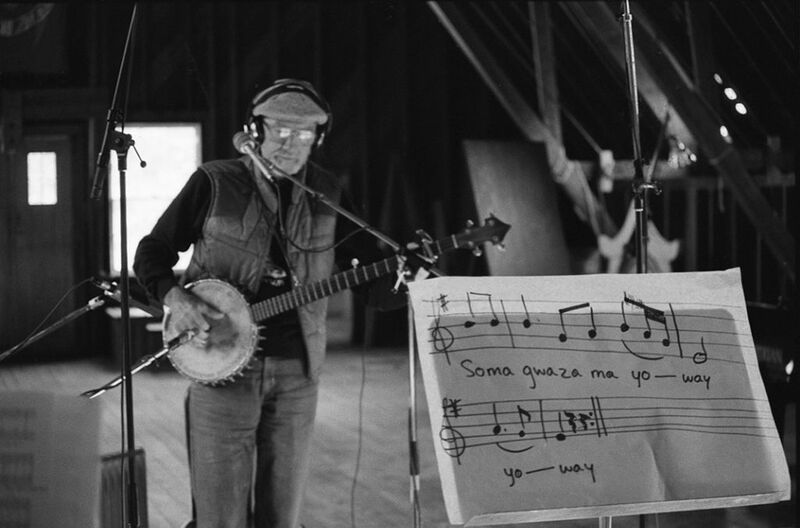 Pete Seeger was born in 1919, the son of a musicologist and a concert violinist. By the time he entered his teens Pete was developing an interest in journalism and music. He applied and was accepted to Harvard University and was in the same class as John F. Kennedy, however after meeting Woody Guthrie in 1940 he dropped out of Harvard and began to travel and perform with Guthrie, starting to write his own songs. In 1942 he was drafted into the Army and sent to fight in the Pacific. In 1948 three years after he returned from the war, he founded a folk group known as The Weavers and within 3 years they sold over four million records. He recorded a song written by his friend Woody Guthrie, "This Land is Your Land," that catapulted The Weavers' folk sound into every home in America. They also recorded Leadbelly's "Goodnight Irene," which topped the charts for six months. Pete continued to write songs, selling them to groups like Peter Paul and Mary, and the Kingston Trio who had huge hits with his songs If I Had a Hammer, and Where Have All the Flowers Gone. Then in 1965 his song Turn Turn Turn was recorded by The Byrds and shot to #1 on Billboard's Hot 100 chart. In 1996 Seeger won the Grammy® for Pete in the Best Folk Album category. Paul Winter produced and recorded the album, and in 2016 Living Music Records, Winter's company, produced a remastered version of Pete's Grammy-winning CD along with a DVD to accompany it. The CD/DVD set is called the Pete-Pak. Paul Winter says of his long-time friend and mentor, "I think of this album as a 'Pete Seeger primer' for the younger generations who are not yet familiar with his music and as a 'Grand Reunion with Pete' for the countless number of folks who grew up on Pete Seeger and hadn't heard from him in years. I wanted for a long time to produce this album, simply because I love Pete's music; and by the term 'music' I mean to include his singing, his songs, his stories, his great instrumental playing, his passion, his humor, and his kindness. Like Bach, Pete is the summing-up of an entire era. He is a treasury of American music; and more than anyone I know, Pete gives voice to the soul of this country." Along with the CD is the Living Music Festival DVD filmed in 1982 and lovingly restored at a videotape restoration facility in Kentucky. The original footage was shot by Phil Garvin. Pete Seeger and Paul Winter had been friends since their first meeting "underneath" the Amadinda at the Newport Folk Festival in 1966. 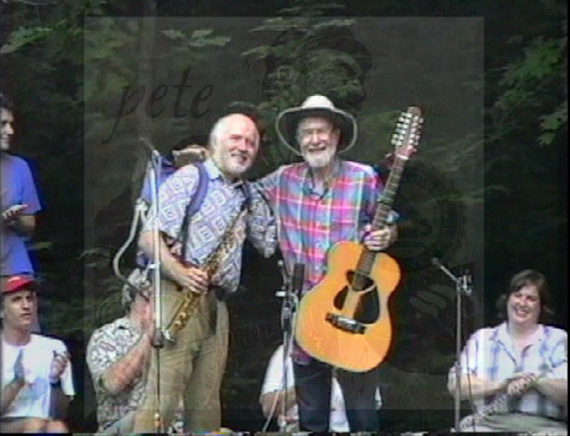 Paul wanted to pay tribute to his friend and mentor by adding a 98-minute DVD of three memorable videos, the(Living Music Festival, the Pete-nic, and Pete Seeger Solo) as part of the Pete-Pak which, seen in sequence, presents a document of the graceful aging of a splendid artist known for his vitality and commitment to the highest standards of liberty, equality and justice, spanning 23 years of the latter part of Pete Seeger's life. 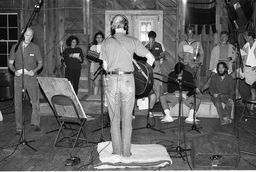 Over the years, Paul Winter had hosted "sing ins" at his barn in Connecticut and Pete had mentioned how much fun it was to sing there. 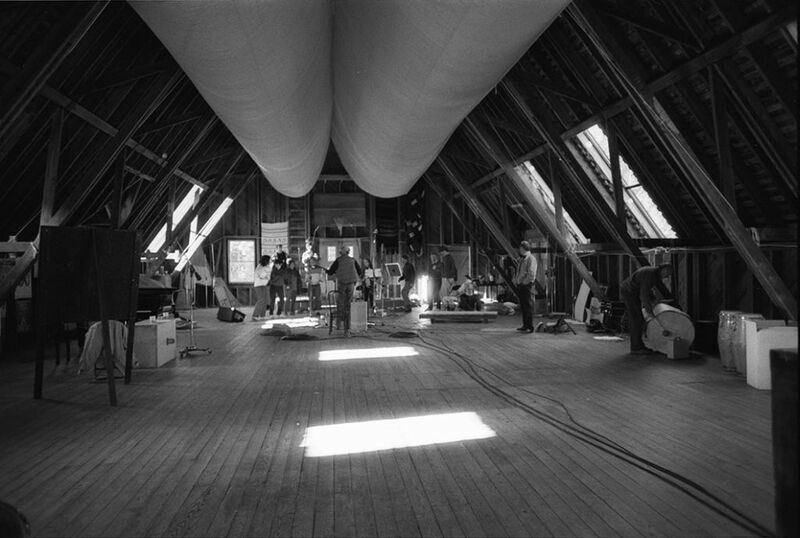 Paul suggested they record a whole album in the barn as he felt the acoustics would really suit Pete's voice. Thus over the next 7 years they had a number of recording sessions at the barn, inviting several choral groups to participate (Gaudeamus Chorus, the Union Baptist Church singers and the Cathedral Chorus). In addition, they invited instrumentalists Joanie Madden (pennywhistle), David Finck (bass), Howard Levy (harmonica), and Paul Prestopino (guitar, mandolin and banjo), with Paul Winter performing on sax and of course Pete Seeger (12 - string guitar and banjo). Pete was initially worried that his voice was "shot," and suggested using backup choirs, however his concerns were unfounded as, when you listen to the 18 songs on this recording, it's clear that Seeger's voice has never sounded better. Singing with the soul of a choir boy, Seeger attacks the 18 songs on "Pete" like a 25-year old performing at his debut at Carnegie Hall. His optimistic whistling on The Russian Song is fast replaced by the insistent claw hammer banjo that he plays so well, replaced once again by the gorgeous sound of the choir Gaudeamus, eventually being replaced by Paul Winter on soprano sax, and then with 4 bass bars as an intro, come the final strains of Beethoven's Ode to Joy sung once again by the heavenly sound of the 30 voices of Gaudeamus, a Connecticut chorus founded and conducted by Paul Halley. Songs that include first time recordings of Huddie Ledbetter Was a Helluva Man,Natural History, and Don West's lyrics to Beethoven's Ode to Joy, are mingled with Seeger classics like My Rainbow Race, Kisses Sweeter Than Wine, and Old Devil Time ending up this almost 60-minute folk extravaganza with the lovely and emotional, To My Old Brown Earth. This CD/DVD collection is a "must buy" for new and old fans alike. The Pete-Pak can be ordered from paulwinter.com. 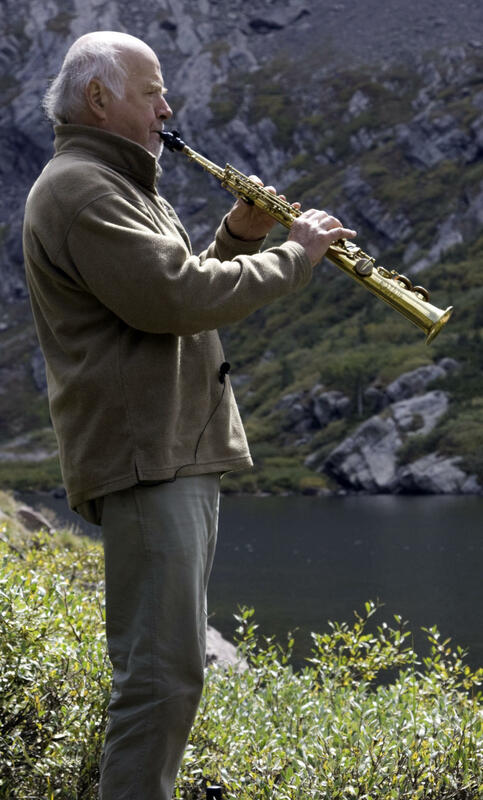 To say that Paul Winter has had a long, successful, and varied career is no exaggeration. His eye view into the music industry has been very adult. When asked how our society could improve music education for kids Winter replied, "We need to awaken their allurement." Heady stuff to place on six-year olds. But, when asked what made Pete's music so special, he said without hesitation, "Pete was real music, coming out of a real guy. He didn't have an egocentric bone in his body." Could Pete's simple "sing-a-long" folk style be a respite for the complex structures of Jazz and World Music that play so beautifully in Paul's head? Could Paul have been charmed by Pete's easy, relaxed way with people? Maybe? 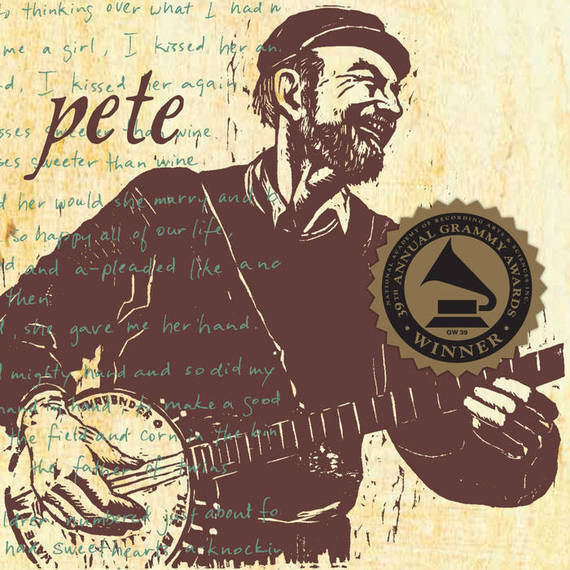 From our perspective, as a couple of veteran war-torn traveling musicians, Paul's reason for honoring Pete with this new Pete-Pak, is exactly what Pete Seeger would have liked. ..... .. it was genuinely for the love of Pete.